Ready to drink whisky-based bottled cocktail, with flavours taking inspiration from the Scottish Highlands. Mac & Wild have improved upon the classic winter tipple known as the Hot Toddy with their very own Mac & Wild Yuletide! They've combined Johnnie Walker Gold Label with Pedro Ximenéz Sherry, mince pies (!) and honey to create this cockle-warming tipple. To serve, all you have to do is mix a hearty measure of Yuletide with hot water then pop in some orange peel and a good stick of cinnamon, and voilà! You've got yourself the perfect beverage to enjoy on a bitterly cold evening! Warm caramel sauce drizzled over cherries, fresh cinnamon, clove and cardamom heat, raisins and buttery shortbread. A subtle hint of smoke lingers. 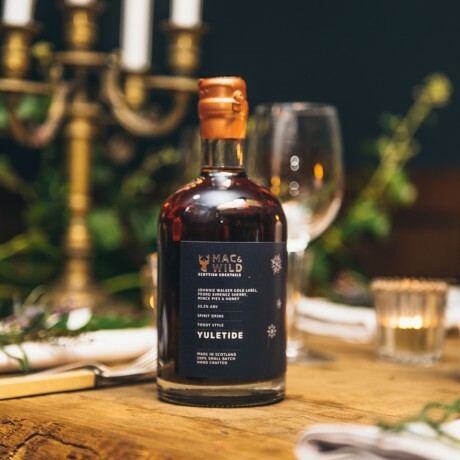 Handcrafted in small batches by experienced mixologist Luke Leiper, who is based in Edinburgh and uses only the finest locally sourced ingredients to ensure it tastes exceptional. 50cl, 23.2% vol.This product contains alcohol. By purchasing this product, you confirm that you are 18 years of age or over. ORDER BEFORE 12PM THURSDAY TO RECEIVE BEFORE CHRISTMAS!